Can faith grow between Iraq to the West and Afganistan to the East? In Persian Springs, Pauline Selby tells the profound true stories of four Iranians whose lives seemed caught in a desert of despair. Each one cried out to God - any God - for help. Each one had a revelation of Jesus Christ. Many surprises as four Persians tell how they came to faith ... before any meeting with foreign missionaries. A dynamic book about God at work among the Iranians. The stories of four Iranianas whose lives seemed caught in a deset of despair. They cried out to God - any God - for help. Each one had a revelation of Jesus Christ. 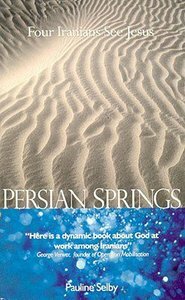 Customer Reviews For "Persian Springs"
Persian Springs is a reminder to all people that noone is beyond God's reach. If we cry out to Him to reveal himself to us, he surely will. Khosrow's story is an encouragement to all of us never to give up praying so that people in the world may understand what it means that Jesus died for their sins on the Cross. After reading such amazing stories I cannot but be grateful for what it meant for me to know that someone had paid the price for my sin. Persian Springs is an easy read and will spur you on towards trusting Jesus more and more.